While I like the concept – a character that can play magical songs – and the archetype is definitely rooted in myth and legend, the d20 version of the class always left me cold. I discovered the Bard in AD&D 2nd and I loved that idea of a jack-of-all-trades class. Bards could do thievery stuff, cast wizard spells and (almost) fight. You can see them as spellcasting Jack Sparrows. They’re awesome and their kits yet more awesome. I can’t explain why, but D&D/Pathfinder Bard never managed to please me. I always searched for “others” Bards, from the Monte Cook’s variant (of the Book of Eldritch Might series), to the unique Everquest d20 version or even the simple (but very elegant) spell-less bard from Castles & Crusades (which inspired this version). I believe one (conceptual) reason is the fact that Bards got their own spell list. This design choice never made sense to me – Bards were just another “school” of arcane spellcasters. For me, either they’re arcane dabblers (AD&D 2nd) or mystical minstrels. If the later, than I believe that they deserve a unique spellcasting system instead of the old “verbal/somatic/material component” vancian spells. I’m aware that it is a weird excuse for an otherwise fine class (especially the Pathfinder version). I recently discovered that even GURPS (through Dungeon Fantasy) has a magical Bard that makes more sense. So, let’s try to a variant “spell-less” Bard for Pathfinder. This was supposedly to be a draft but damn! this is a blog, not a commercial PDF, so let’s see what you think of this madness. This is a Bard archetype. It follows all the normal rules, but it removes Bard Perform (and its subsequent abilities, like Inspire Courage) and Spells. Instead of the aforementioned class feature, the Minstrel gains Bardic Arts. First thing: you gain 1 free rank of Perform skill per Minstrel level. This bonus skill point must be spent by the normal rules in one of the 9 official categories of Perform (Act, Comedy, Dance, Keyboard instruments, Oratory, Percussion instruments, String instruments, Wind instruments or Sing). Second thing: A 1st level Minstrel begins with 2 Bardic Arts, plus another Art for each even Minstrel level (to a maximum of 12 Arts at 20th level). Each Minstrel must choose one Perform category for each Bardic Art (to a maximum of a 4 Bardic Arts for each category). She can only use a specific Bardic Art with her chosen Perform. Third thing: Unless noted otherwise Arts are supernatural mind-affecting abilities and require a standard action (that doesn’t provoke attacks of opportunity). Keeping a Bardic Art in effect doesn’t require any action. However, to activate a second Bardic Art while playing another does requires another standard action. A Minstrel can keep, at first, a maximum of 3 Bardic Arts playing at the same time. At 10th level he can keep 4 Arts, at 16th 5 Arts and all his Arts at 20th level. Saving throws against Bardic Arts have a DC of 10 + half the Minstrel’s Perform bonus. 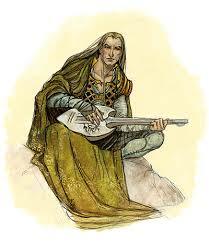 For example, the Bardic Arts of 5th level Minstrel with Perform (Sing) +11 has a DC of 15. To Nurse Burdened Spirits: if the Minstrel executes her chosen Perform for 1 entire hour, all targets that are resting within 90 ft. of him during the entire performance regain a number of hit points equal to the skill roll and remove the fatigued and exhausted conditions. If the Minstrel accepts a -10 penalty to his check and still scores a positive result, the targets also regain 1 use of a daily ability, 3 rounds of abilities that work on a round-by-round basis (like rage) and 1 spell slot. If the Minstrel plays her chosen Perform for 4 hours, the targets regain hit points and also all the benefits of a full night of rest (although this use of the Bardic Art leaves the Minstrel fatigued). This Art can only be used once every 24 hours. No creature may benefit of To Nurse Burdened Spirits more than once every 24 hours. Soothe Beasts: the Minstrel can substitute her chosen Perform for Diplomacy against animals, magical beasts and dragons within 60 ft. This use of Perform requires only one round and works like Wild Empathy. Retries aren’t allowed. If the Minstrel can keep these beasts at bay and executes her chosen performance for 1 entire minute, she can affect the targets as if by a charm person for as long as she plays (and a number of hours after that equal to her Perform check). Intelligent targets are allowed a Will saving throw to negate the charm effect. Spell Breaker: the Minstrel can ready an action to counterspell or to negate any sonic or language-dependent effects (like a harpy or siren song, or even a sonic attack). This art also works against spells with sonic components. She rolls use her Perform skill as her caster level check to counterspell. If used against a monster’s attack, the Minstrel rolls her Perform skill against the creature’s HD plus its key ability score modifier. The Minstrel can accept a -10 penalty to counterspell as immediate action. Each additional use of this Art in the same encounter incurs a cumulative -2 penalty. Sandman: the Minstrel can induce a strong languor on targets within 60 ft. that aren’t threatened or alerted by a hostile force. The Minstrel must roll a Perform check (DC 10 + highest HD among targets + highest Charisma modifier among targets). Affected targets are fascinated. This conditions remains until broken or after a number of minutes equal to the Minstrel’s Perform check. Finally, the Minstrel can also induce a supernatural sleep on fascinated, fatigued, exhausted or unconscious targets. Fascinated, fatigued and exhausted creatures are allowed a Will saving throw. Those affected by the sleep will slumber calmly for a number of hours equal to the Minstrel’s level and can’t be awakened unless damaged (or by dispel magic). This secondary use of Sandman requires 1 minute of playing. Targets that successfully save are staggered for 5 rounds. This art can only be used once per encounter. Honed by the Muses: through her performance, the Minstrel enchants her ally’s weapons against supernatural or resilient foes. This Art doesn’t require a Perform check, but the Bard must spend a standard action to activate it. One round after starting her Perform, the party’s attacks works as magical weapons for the purpose of bypassing damage reduction. A 4rd level they work as cold iron and silver. A 7th level Minstrel they bypass DR/adamantine. A 10th level they bypass alignment-based DR. While playing this Art, the Minstrel can use his Perform check to reroll one failed critical hit confirmation of an ally, as an immediate action. Beacon of Valor: the Minstrel boosts his allies’ spirit. This Art doesn’t require a Perform check, but the Bard must spend a standard action to activate it. All allies within 60 ft. that are cowering, panicked, frightened or shaken gain a new saving throw, as an immediate action, using the Minstrel’s Perform skill. This Art also automatically suppresses all fear conditions by one step (ex. : frightened becomes shaken, shaken becomes normal etc.) – this secondary effect remains only for as long as the Minstrel keeps playing. If the Minstrel himself is affected by a fear condition, he can choose to start this Art as an immediate action, but his Perform check suffers a -20 penalty. Cry havoc! : the Minstrel call his comrades to battle. This Art doesn’t require a Perform check, but the Bard must spend a standard action to activate it. All allies within 60 ft. gain a +1 morale bonus to all attack, combat maneuver and damage rolls. This bonus increases by +1 at 4th level and every 3 levels thereafter. Once per round, as a swift action, the Minstrel can grant a reroll to one ally’s attack. The Minstrel uses his Perform skill to reroll the attack. Soul bending Art: the Minstrel can impose a condition against any creature within 60 ft. that can see or hear him. A Will saving throw is allowed to negate the effect. This Art doesn’t require a Perform check, but the Bard must spend a standard action to activate it. A creature that successfully resists this Art is immune to it for the next 24 hours. Conditions that can be inflicted are confused, staggered, flat-footed, entangled, sickened or prone. At 7th level he can inflict the deafened and stunned conditions. The Minstrel can affect one additional creature for each 2 levels, but must succeed on a Perform check (DC 10 + highest HD among targets + highest Charisma modifier among targets, +1 for each additional target). All imposed conditions last 1 round, though the Minstrel can increase the duration with a Perform check (increase the DC by +2 for every additional round). To Lift Burdens: the Minstrel can postpone the effects of the dazed, disable, dying, confused, nauseated, sickened, staggered and stunned conditions affecting one target. This Art only works if the condition is temporary (i.e. not inflicted by effects that can only be removed by break enchantment or remove curse). The Minstrel must make a Perform check against the original DC of the effect (or the original attack roll, if the condition was inflicted by an attack or combat maneuver). If successful the condition is kept at bay for as long as the Minstrel plays. Shatter Curse [Pre-requisite: Spell Breaker]: the Minstrel can revoke a curse or spell, like the break enchantment or remove curse. This Art requires 1 hour of playing and Minstrel uses a Perform check (instead of a caster level check). However, if the enchantment, transmutation or curse is of equal or higher level, a Minstrel that fails his check automatically suffers its effects (no saving throw). To Tame Savagery [Pre-requisite: Soothe Beasts]: the Minstrel can enlist the aid of an animal, magical beast or dragon charmed by Soothe Beasts. She can keep a number of charmed beasts equal to double her HD. This Art requires 10 minutes of playing and lasts a number of hours equal to the Perform check. Charmed beasts, once released of this Art, can’t be affected again for a month. From the Heart: the Minstrel inspires confidence in the target. After rolling any Ability Score or Skill check, but before determining the results, the target can instead let the Minstrel use his Perform check. This Art can only be used once each encounter. Seduced by the Art [Pre-requisite: Sandman]: the Minstrel can charm person any target fascinated through Sandman. A Will saving throw is allowed to negate the effect. If successful, the target is immune to the Minstrel’s Arts for the next 24 hours. This Art lasts a number of hours equal to the Perform check. Untouchable: the Minstrel raises himself, through his Arts, above conflicts and violence. For as long as the Minstrel plays and abstains of violent actions, she can’t be the target of any attacks. This Art requires a move action to be maintained every round. This works like sanctuary and a Will saving throw is allowed to negate the effect. As an immediate action, the Minstrel can cancel this Art to reroll a failed saving throw of any ally within 30 ft. Untouchable can only be activated once per encounter. Mysteries of the Underworld [Pre-requisite: any other 2 Arts]: the Minstrel can affect creatures of the undead type with his Arts (undeads are normally immune to mind-affecting effects). Mindless undeads won’t attack the Minstrel, treating him as one of the own, unless provoked first or after succeeding at a Will save. The Minstrel gains the benefits of tongues when interacting with undeads. Finally, once per day, while standing over a corpse, remains or location where many had fallen (cemetery, battlegrounds etc.) the Minstrel can speak with dead, like a caster of the same level. He must succeed The Minstrel gains the benefits of tongues when interacting with undeads. After using this Art, the Minstrel bears the taint of the dead, suffering a -4 penalty on Diplomacy and Handle Animal checks, and +4 bonuses on Intimidate checks with the living. Lore of the Woods [Pre-requisite: any other 2 Arts]: the Minstrel can affect creatures of the plant type with his Arts (that are normally immune to mind-affecting effects). Plant and fey creatures won’t attack the Minstrel, treating him as one of the own, unless provoked first or after succeeding at a Will save. The Minstrel gains the benefits of tongues when interacting with plants and fey. Rise! Rise my friends! [Pre-requisite: Beacon of Valor, Cry Havoc!, To Lift Burdens]: the Minstrel keeps his companion’s going through the will of his Art. He can affect one ally within 60 ft. for every two Minstrel levels, granting to them a number of temporary hit points equal to the result of a Perform check. This Art can only be used once per encounter and requires a full-round action to be activated. Song of the Spheres [Pre-requisite: Lore of the Woods and Mysteries of the Underworld]: for as long as the Minstrel perform, he creates a 30 ft. circle where the rules of the World prevail. Outsiders and extraplanar creatures can’t step inside this circle, unless attacked by anyone inside of it. The circle can be dispelled or ignored by otherworldly creatures with Spell Resistance (in both cases use the Minstrel level as his caster level). This Art can be sustained for a number of minute equal to the Minstrel’s Perform skill bonus. It can be used once per day. Music to the Elements [Pre-requisite: any other 5 Arts]: the Minstrel can soothe the elements themselves, alluring them to do his biddings. After performing for 10 minutes, chosen elemental manifests form the local setting (earth, fire, air or water). The elemental can be huge or smaller. The Minstrel must then succeed on a Perform check (DC 10 + elemental’s HD + elemental’s Char modifier). The force of creation will perform one service to the Minstrel in exchange for his arts. Music to the Elements can only be used once per encounter. Each subsequent use in the same day incurs a -5 penalty. Failing by a margin greater than 5 incurs in the wrath or displeasure of the local spirits. Inspired by the Furies [Pre-requisite: Cry havoc! and Honed by the Muses]: the Minstrel’s Art exhorts his allies to actions of violence and mayhem. This Art requires one full-round action to activate and a move-action to maintain. Once activated, Inspired by the Furies grants a pool of d6s equal to half the Minstrel’s Perform bonus. He can grant these dice to his allies’ damage rolls, if they’re within 60 ft. The dice are given only after the enemy is hit, but before damage is rolled. The Minstrel can grant a maximum number of 2 dice to each damage roll. At 10th level he can grant 3 dice, then 4 at 15th and finally 5 dice at 20th. If a round goes by in which no dice is given, the Minstrel immediately loses 2 dice from his pool and suffers 2d6 points of damage (the Furies are ever bloodthirsty). This Art can be used once per encounter. Voice of the Giants [Pre-requisite: any other 5 Arts and a sound-based Perform skill]: the Minstrel unleashes the voice of the titans. This Art requires a full-round action to start, building as an inhuman crescendo. While keeping this Art, the Minstrel can as a swift action, once per round, use shatter, with a caster level equal to his class level. Each time he does so, he must succeed at a Fort save or become fatigued. After three rounds, the Minstrel can utter the wrath of the deities against a single object or creature of any size within 30 ft. This target is instantly affected by a disintegrate spell, with a caster level equal to the Minstrel’s level. All other creatures (allies and enemies) within 60 ft. must also succeed a Fort save or become deafened for 1d20 rounds. This last use ends Voice of the Giants and leaves the Minstrel mute for 16 hours, besides exhausted. Formless Words: the Minstrel can share his thoughts and commune with the hearts of his comrades through this Art. While executing his chosen Perform, the Minstrel can communicate with any ally in line of sight within 60 ft. He can also hear his friend and let them speak through his performance. Basically, this Art lets the Minstrel and his allies share a telepathic conversation. This Art requires a standard action to be maintained. Formless Words only requires that the Minstrel knows the target’s names and that they’re willing (otherwise, they gain a Will save with a +5 bonus). However, the Minstrel also can use this Art to discover other True Bards and talk with them, establishing a telepathic conversation during his Performance. This Art can only be used once per day. Arts of Command: the Minstrel enforces, through his chosen Perform method, a mystic ban (for example: don’t cross this door, don’t use your staff, don’t cast a spell, don’t attack one specific person, don’t lie to the king etc.) against a target within 30 ft. This requires a successful Perform check (DC 10 + target’s HD + target’s Char modifier). If this commandment is broken, the target automatically suffers the Minstrel class level in d6s of damage (Fort halves). Spell Resistance applies. Arts of Command last a number of minutes equal to the Perform check result and can only be used against the same target once every 24 hours. Here's one of another of my homebrew Base Classes for Pathfinder. The warlord class from D&D 4th was by far my favorite addition to the game. While the class' rules are a perfect excuse for all kind of silly jokes (we call the warlord the "self-motivational class"), the entire idea behind the character is totally playable and very fun at the table. 1) The Profession (Soldier) skill. We use this skill to roll for Advantage at the beginning of every combat. It's a very cool rule, stolen from the amazing The Black Company Campaign Setting, you see more here. 2) Combat Reactions are an awesome rule from Trailblazer, a book that I can't praise enough (more here). Edit: I forgot to mention. This class is based on the original version designed by my player and fellow GM, Leoz. Thanks! Skill Ranks Per Level 4 + Int modifier. The following are class features of the warlord. A warlord is proficient with all simple and martial weapons and with all armor (heavy, light, and medium) and shields (but not tower shields). At 1st level, the warlord begins to demonstrate the brilliance of his battlefield leadership. The warlord and all his allies within 30 ft gain a +2 morale bonus to initiative. This bonus increases to +3 at 6th level, +4 at 14th level and +5 at 20th level. A warlord adds half his level as bonus to all Profession (Soldier) checks. The mere appearance of a warlord upon the field of battle has a positive impact among his allies. The warlord must choose to have a Ferocious or a Cautious approach to combat. Both abilities affect all allies that are under the effects of the warlord’s inspiration (see below). Ferocious Leader: allies gain a +1 morale bonus to attack and weapons damage rolls. Cautious Leader: allies gain a +1 morale bonus to armor class and Reflex Saves. This bonus increases to +2 at 8th level, and +3 at 18th level. At 20th level the warlord give both bonuses to his allies. During battle, the warlord exhorts his comrades with words of courage and determination. This inspiration affects all allies within 30 ft. and bestows 1d6 temporary hit points, plus 1d6 additional points for every two warlord levels beyond 1st (2d6 at 3rd, 3d6 at 5th, and so on). These temporary hit points last until the battle ends, or until they are removed through damage. A warlord may inspire a number of times per day equal to 3 + his Charisma modifier. This is a move action and does not provoke an attack of opportunity. The warlord can choose whether or not to include himself in this effect. As the warlord gains levels he can choose to use his Inspiration in other ways. At 2nd, 4th, 8th, 12th, 16th and 20th level the warlord may take a bonus feat from the following list. The warlord must meet any prerequisites when taking a feat. Animal Affinity, Cleave, Combat Reflexes, Combat Expertise, Diehard, Endurance, Extra Inspiration, Great Cleave, Greater Weapon Focus, Greater Weapon Specialization, Improved Critical, Improved Initiative, Intimidating Prowess, Improved Vital Strike, Leadership, Mounted combat, Power Attack, Ride-By Attack, Spirited Charge, Trample, Vital Strike, Weapon Focus, Weapon Specialization. At 2nd level, the warlord gains the ability to bolster a defensive line. When forming a defensive line (fighting defensively or using Combat Expertise and standing adjacent to one another), the warlord and all allies gain a +2 competence bonus to AC. At 3rd level a warlord gains an extra combat reaction per round. Also he can spend an Inspiration use to allow his allies to use an extra Combat Reaction per round till the end of the battle. If you’re not using Combat Reactions (from the Trailblazer product), the warlord gains instead an extra attack of opportunity that can be given to any ally in sight that can hear the warlord’s commands. At 4th level the warlord gains the ability to use his Inspiration to rally others. The warlord and all allies under the effect of Inspiration gain a +2 morale bonus on saves against fear spells and effects. Even if they fail their saves, the level of fear is reduced by one degree (minimum shaken). This bonus increases to +3 at 11th level and +4 at 15th level. The warlord can, as an immediate action, spend a daily Inspiration use to allow allies to reroll a failed fear save. The warlord also gains another daily use of Inspiration. At 6th level, the warlord can spend an Inspiration use to give his allies the bonus of the Endurance feat for one day. If any of the allies already has the feat the bonuses granted are doubled. At 8th level the warlord gains the ability to use his Inspiration to increase the loyal bonds between his allies. The warlord and all allies under the effect of Inspiration gain a +2 morale bonus on saves against charm spells and effects. Even if they fail their saves they can’t be ordered to attack one another. This bonus increases to +3 at 13th level and +4 at 17th level. The warlord can, as an immediate action, spend a daily Inspiration use to allow allies to reroll a failed charm save. At 10th level, the warlord may inspire his allies to attack a specific target, overwhelming the enemy. The warlord spends an Inspiration use and designates a particular target. Until the end of the warlord’s next turn, any attack roll against that target have a doubled critical threat rage, and receive a +4 morale bonus to confirm the results of a critical hit. At 11th level the warlord gains Leadership as a bonus feat. If the warlord already has Leadership he gains another cohort, and the level of his cohorts are not affect by negative modifiers. At 12th level the warlord can use a personal heraldic banner as focus to his Inspiration uses. As long as his banner stands proud in the field he can use Inspiration as a swift action. He can now affect any target in the field that can see his banner. If the warlord’s Legendary Sigil is lost to or put down by enemies he can’t use his Inspiration during that particular encounter; besides, all Inspiration-based abilities are lost and all his allies receives a -1 morale penalty to all their tests. This penalty is kept until the banner is recovered or the battle ends. If the warlord doesn’t recovery his banner until the end of the encounter he loses half his total remaining Inspiration uses for the day. At 14th level the warlord is feared and respected in any field of battle. If carrying his Legendary Sigil, all enemies must make a Will save (DC 10 + half class level + Cha modifier) or suffer a -2 morale penalty until the end of the battle. This isn’t a fear effect. At 16th level the warlord can inspire his allies to supernal levels confidence and valor. By spending 2 daily uses of Inspiration he can give to his allies a DR 5/- and Energy Resistance 5 against all elements until the end of their temporary hit points. 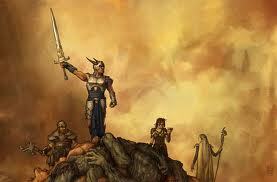 At 20th level, the warlord may exhort their allies to glory. By spending 2 uses of his Inspiration, the warlord and all allies gain a free attack when executing any standard action, until the end of the warlord’s next turn. At 20th level the warlord’s presence inspires his allies to make the ultimate sacrifice. Any allies affected by the warlord’s Inspiration can continue to fight even while disabled or dying. They ignore both conditions and can continue until they reach –20 hit points. Finally, the warlord regains a daily use of Inspiration after any confirmed critical hit (except while using Cry Havoc! ).